If you’re in need of a great new watch, then consider one of the Bvlgari watches. These sleek timepieces are expensive looking, but affordable. They also have a unique style that many luxury watches don’t possess. If you buy a Bvlgari watch you can expect a lifetime of quality. If you don’t like the colors, but like the overall design then there are many choices. But one really similar one but different colors is the Bvlgari B.Zero1 Women’s BZ22BSS.S watch. They have all the same features. Their only differences are that the Bvlgari B.Zero1 BZ22BSS.S has a black dial window and the Bvlgari B. Zero1.BZ22BSS/12.M has a blue mother of pearl one. They are also priced differently. The Bvlgari B.Zero1 BZ22BSS.S originally retails for $ 2,600 and the BZ22BSS/12.S watch costs $3,300 . So there aren’t many differences between the two watches so picking between them may depend on very small factors of colors and price. Bvlgari B.Zero1 Women’s BZ22BSS/12.M watch is beautiful, affordable, and great for bracelet lovers. This watch will look great on your wrist. It also won’t bankrupt you buying it. It’s a great watch that any woman or girl might love. The only glaring flaws are that you can’t really use it to tell time, and it almost looks too much like a bracelet to get labeled a watch. Great choice for an additional piece to add to your jewelry collection, but not a good choice for a watch to tell the time of day. A delicate watch can represent a woman’s style perfectly. She’ll wear it at special occasions and casual events. It’ll share memories with her as she grows and changes, a great luxury watch will last with all her major moments. There are many watches that may fulfill her needs, but if she wants something small and unique then she might choose one of the Bvlgari watches. One that might specifically meet your needs is the Bvlgari B.Zero1 Women’s BZ22BSS.S watch. If you’re looking for a cool watch that really shows off a distinctive design then the Bvlgari B.Zero1 Women’s BZ22BSS.S watch is a good choice. But it’s not the only watch made by Bvlgari that has this design. There are a couple others, but the one that most closely resembles the B.Zero1 BZ22BSS.S is the BVLGARI B.zero1 Quartz Women’s BZ22BSS/12.S watch. Both watches have a tiny clock window and a stainless steel wrist clap. They also contain the same features, like 22mm diameter, 30 meters water resistant and things such as that. The only real difference between them is price and the clock window. Neither watch actually have numbers, but the Bvlgari B.Zero1 BZ22BSS.S watch has little squares that stand in place of numbers. The BVLGARI B.zero1 BZ22BSS/12.S watch has little circles that look like diamonds. The inside of the clock window of the BVLGARI B.zero1 BZ22BSS/12.S is blue and the Bvlgari B.Zero1 BZ22BSS.S it’s black. The Bvlgari B.Zero1 BZ22BSS.S costs $ 2,600 (not on sale) and the BZ22BSS/12.S watch costs $3,300 (not on sale). So there aren’t many differences between the two watches so picking between them may depend on very small factors. Overall, the Bvlgari B.Zero1 Women’s BZ22BSS.S watch is really rare in its design and any girl would love to wear it. But for those women that want a reliable method of telling time, this is not your watch. But if you just want a pretty unique timepiece then this may be perfect for you. The Bvlgari Bvlgari Women’s BB23BSSD/N Watch is the ideal every day watch for the modern working woman. Beautifully made, it’s classic, sleek design is perfect for the office or any professional setting. It’s uniformity keeps it from standing out and becoming too distracting in the workplace, but it’s grace and elegance are sure to keep it from going unnoticed. 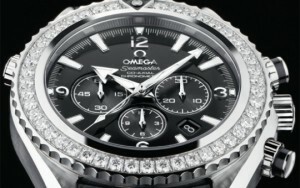 This timepiece is made from stainless steel, with a stainless steel bezel and sizable, 7 inch stainless steel bracelet. The bracelet finish is brushed and high polished, with a deployment buckle clasp. The watch is water resistant up to 30 meters, which makes it ideal for any light water exposure, including rain and light recreational swimming. The crystal covering the ideal is made from sapphire, which is the most expensive and durable type of covering, insuring your watch against the typical scratches and knicks commonly acquired after daily use. The ideal itself is a class, uniform black that is sure to go with every outfit and occasion. This watch is great for a women who finds herself going from the office to dinner or other social events without time to change in between. It’s class evokes a certain sophistication without being excessively opulent or showy. This watch is made well, from high quality materials like the sapphire scratch resistant dial covering and all the stainless steel. It also comes with the satisfaction of owning a sophisticated Bvlgari watch that has a great reputation and is perfect for the office. This watch does not come with many extra features, but if you’re looking for something simple and classic, then this could be the watch for you. My main issue with it is that it can be a little boring. If you’re looking for a watch that gets a lot of attention on the street or out with friends, I don’t think this is the right timepiece for you. This watch retails for $4,400, so it also isn’t ideal if you’re looking to spend less than a few thousand dollars on your watch. Overall, I’d say this watch is a good byt and well worth the money. If you’re looking for a simple, classic watch without a lot of bells and whistles, the Bvlgari Bvlgari Womens Watch BB23BSSD/N could be the watch for you. A pretty bold declaration by the Bvlgari company, but with decades of experience, and excellent services, they may live up to their promise. Does gold shine in your eyes? Do diamonds mesmerize you? Do you want a watch that makes traditional watches look dated? Are you the trendsetter among your inner-circle? Then a watch that might fulfill your timepiece needs is the Bvlgari Assioma D Women’s AA31WGD1GD1 watch. This watch is beautiful, but might not perfectly fit your style. Maybe you love gold, but not diamonds? Well if that’s the case then the Bvlgari Assioma D Women’s AA31WGG watch may be your perfect fit. The watches are almost completely designed the same and have all of the same features. The only differences are that the AA31WGG is only water resistant for 30 feet, costs $23,600 (the AA31WGD1GD1 costs $50,000), and the AA31WGG has no diamonds on it. The major two factors in deciding between these are probably cost and appearance; gold or diamonds? Sometimes gold can be a very big asset for a timepiece, sometimes it can be its downfall, where does gold fall for the AA31WGD1GD1? Overall, the Bvlgari Assioma D Women’s AA31WGD1GD1 watch has a great appearance. The appearance makes a bold statement, and it’s bound to draw attention to you. However, it looks so much more like a bracelet, and gives no real focus, or consideration to the timepiece aspect of it. Instead of buying this, you’re probably better off buying a gold and diamond bracelet and getting your watch elsewhere. Bvlgari does create a visually pleasing watch, but fails to accentuate the key component of this piece: the time window.